I'm going to purchase bone marrow for the first time this week, but have no idea what to look for in good bone marrow. How much do I need to buy for a meal? Thanks for the advice! I've only seen bone marrow cut quartered, but I can see how it would be easier to deal with cut length-ways. I'll definitely try to get it that way. Look for good fat to bone ratio, basically. I usually request mine cut length-ways rather than quartered. This: http://www.familyfriendlyfood.com/wp-content/uploads/2009/03/brasabonemarrow.jpg Rather than this: http://farm2.static.flickr.com/1430/1144639146_ea31dde652.jpg They're easier to season, easier to access the marrow as well. How much you need is on you. Although, I would say they aren't much of a meal... That would be like making a meal of a stick of butter, it's almost pure fat. Parsley salad is a traditional accompaniment, they work really well together. I'll usually have 1 bone cut length-ways into two pieces with parsley salad and a protein. 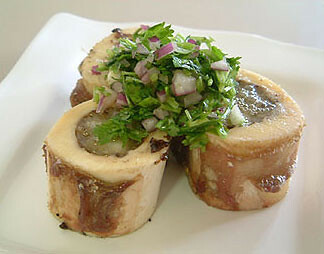 Here's a good example of the ratio thing: http://3.bp.blogspot.com/_eG9qSokqkgs/TB5-X6JLprI/AAAAAAAAAOc/dT15_8PFzKo/s1600/DSC00188.JPG Avoid the narrow marrow bones, they're more fuss than it's worth.